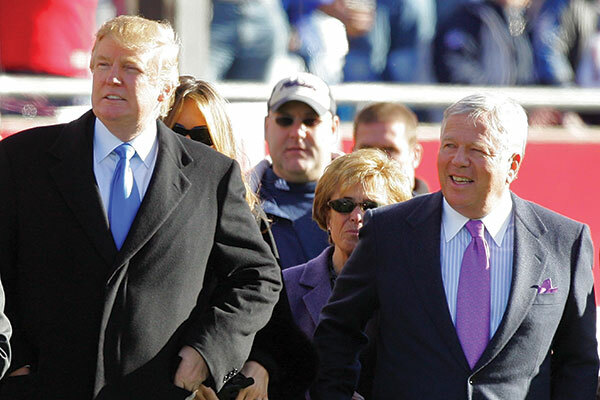 Before he was president, Donald Trump joined his friend Robert Kraft on the sidelines of a game. I’ll start by saying I’m not going to gloat. The residents of Jets and Giants country don’t want to hear from an entitled Patriots’ fan whose team just pulled off the greatest comeback in Super Bowl history and in the process humbled a vindictive commissioner for railroading the team’s honorable and oh-so-handsome star quarterback for the alleged crime of being generally aware of a ludicrous deflation “scheme,” despite a lack of any evidence and contrary to the laws of science. So you can relax. You won’t hear about any of that from me. It is worth mentioning, however, the question we had the displeasure of hearing repeatedly during the interminable two-week build up to the big game: Could fans of the Patriots continue to cheer on their team once it became clear that owner Robert Kraft, head coach Bill Belichick, and the aforementioned handsome QB, Tom Brady, were friends with President Donald Trump, and that some or all three of the five-time champs may have even voted for him in November? We should have seen this coming. With the country polarized at levels well below the Civil War, but far above Newt Gingrich’s “Contract with America,” even professional sports, which, aside from those who work in the industry, are a glorified distraction (this coming from a man who couldn’t see the idiocy in throwing his own glasses in anger when Brady threw an inexcusable interception. The frames are being held together with copious amounts of Krazy Glue. Really. ), have become politicized to the point that rooting interests are akin to an endorsement of someone else’s preferred candidate. Politics and sports have always had a loose connection to the other. Legendary boxer Muhammad Ali was stripped of his heavyweight title and sentenced to prison for draft evasion; Jesse Owens took on the Nazi party in his dominance of the 1936 summer Olympics; black Olympians Tommie Smith and John Carlosstare raised their fists to symbolize Black Power as they stood on the podium while the Star Spangled Banner played in 1968; and this past NFL season, San Francisco 49ers backup quarterback Colin Kaepernick — and subsequently several other players — kneeled during the pregame national anthem to protest violence against African-Americans. Let’s remember something: These are professional athletes, and although the seeming perfection of their physiques might give the impression that they are robots, they aren’t. Not only do they have opinions, but sometimes, despite the frantic attempts of well-meaning PR professionals, they say them out loud. This tends to happen when a dozen reporters shove microphones in front of 20- or 30-something-year-old athletes and ask them inane questions every day for six months. Inevitably something’s going to slip past the team’s closely guarded firewall designed to ensure that no one in the organization says anything remotely interesting. As a reformed sports writer, I know this dance well. Retired NBA star Charles Barkley once said in a famous commercial for Nike, “I’m not a role model…Just because I dunk a basketball doesn’t mean I should raise your kids.” Of course he was right, and if we shouldn’t hold athletes to a standard that our children can emulate, why should adults care if a player favors one candidate over another? Incidentally, Brady’s wife, supermodel Gisele Bündchen, responded to a question on Instagram prior to the election asking if she and her husband would vote for Trump with a resounding “NO!”—but it shouldn’t matter. Even if you strongly disagree with Trump’s views, statements, cabinet picks, locker room talk, or his decision to scotch tape his ties, almost 63 million Americans voted for him, so for the umpteenth time liberals and those who just don’t like the guy need to stop demonizing every one of his supporters. Kraft, who unlike his fellow NFL owners has donated more to Democratic candidates than Republicans, has admitted to his long-time friendship with Trump, and even showed up at Trump Tower to meet with the president-elect before his inauguration. 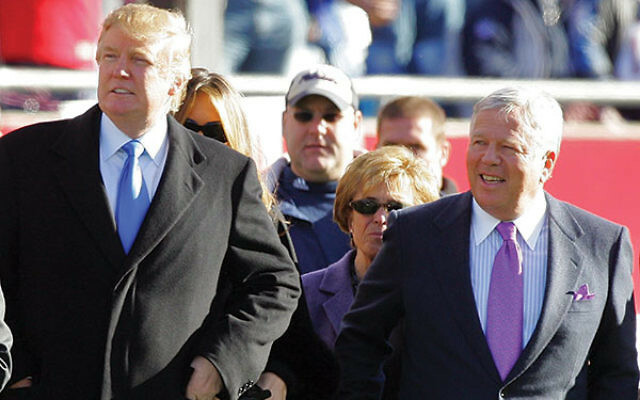 According to the Patriots’ owner, Trump called to check on him every week in the year after his wife died, and Kraft was unwilling to break off his relationship with someone who treated him so kindly, despite his many bombastic statements. Even if that doesn’t sway you, keep in mind that Kraft has given millions to charitable causes, many of them Jewish, and spent $6 million to build a football stadium in Jerusalem. He also leads missions to Israel most years for current and former NFL players — Hall of Famer and former Jets and Patriots running back Curtis Martin went in 2015 and current Patriot Martellus Bennett has committed to go this year — and last year he received an honorary doctorate from Yeshiva University for his philanthropic work. Kraft is responsible for so much good in the world, and being friends with Trump should not take away from that. Everyone knows a friend of a friend they don’t like, and even if you didn’t vote for Trump you probably know someone who did. In most cases, you’re probably able to overlook what you consider to be their bad taste or warped political views. And here’s something for those who still can’t stomach any pro-Trump views: Both Bennett and Patriots’ safety Devin McCourty have voiced their intentions of skipping the traditional ceremony at the White House during which the president honors the champs. “Basic reason for me is I don’t feel accepted in the White House. With the president having so many strong opinions and prejudices I believe certain people might feel accepted there while others won’t,” McCourty wrote in a text message to Time. So there’s that. As for Belichick…well, if you’re not already a Pats fan I’m quite certain there’s no way I’ll convince you to forgive the Hoodie. His stoic, arrogant demeanor is a legitimate reason to dislike the team, as is the fact that they’ve dominated the league for an unprecedented 16 years, even while the NFL has done everything in its power to knock them off its pedestal, taking away multiple first-round draft picks and suspending a legend for four games for reasons related to spite and jealousy rather than facts.